How are we to approach the relationship to the symptom inherent in Freud’s third identification? Each project or enterprise makes assumptions about what effects are or are intended to be created on their target customers or clients, and how. But in doing so, the project or enterprise also takes up a particular way of ignoring or leaving out. This exercise is intended to take about 60 minutes, and to help you think about what is ignored or left out by the way a project’s or enterprise’s effects are created. Meeting in threes, one person takes the role of the speaker, one of the listener, and one of the ‘plus-one’. The person in the ‘plus-one’ position should manage the time boundaries, ideally using a time or someone’s smartphone. For about 5 minutes, the speaker [2 in the diagram below] gives an account of a challenging situation faced by or facing their project or enterprise and how it was or is impacting on its intended effects. This first situation is the originating situation. Note that the speaker is speaking about waht is going on [wigo – 1 in the diagram below], which is the larger context in which the originating situation is situated. The listener  listens to this account in silence, and then for a further 5 minutes asks for elaboration and clarification until s/he understands the account being given, concluding with his or her summary understanding of the nature of the challenging situation being presented. This understanding constitutes a ‘reading’ of the situation presented by the speaker. The person in the ‘plus-one’ position  has been listening to the way this speaking-and-listening process has made sense of the challenge. In the next 5 minutes s/he selects a single metaphor that best speaks of the overall sense that has emerged from the speaking-and-listening about the situation. The plus-one then elaborates on the metaphor as if it were a dream, making no attempt to relate its contents to the situation. The positions are then rotated two more times for two more 15 minute cycles, so that the plus-one becomes the speaker, the speaker becomes the listener, and the listener becomes the plus-one. In these second and third cycles, the speaker selects a situation from their personal experience that speaks to the metaphor they came up with as plus-one. In the last 15 minutes, the trio discusses what questions the metaphors raise about the originating situation in terms of ‘gaps’ and the risks they imply at present. Each project or enterprise sets up this circuit of relationships between ,  and  in which the relationship between  and  is implicit in the way  gives an account of . What is being ignored or left out by  is the particular ‘beyond’ or ‘lack’ of wigo, represented by what lies beyond the bottom thick line, referred to as what-is-Really-going-on (wiRgo). The other thick line between  and the  circuit itself is to indicate that  only has access to the  circuit via  under the influence of . 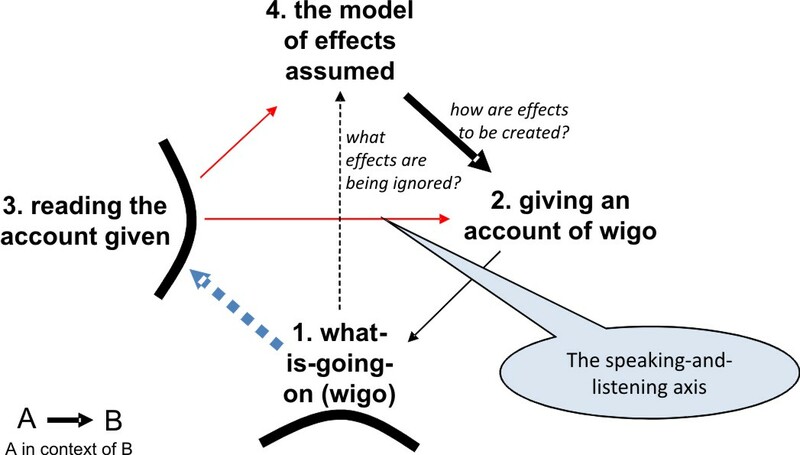 The process of active listening  allows the particular account of wigo  by speaking  to be known in such a way that a sense of its relationship to the framing model  can emerge, knowledge of  always being mediated by the way  speaks under its influence. The other dotted-line axis is an impossible axis, in the sense that it cannot be held directly in the way that the speaking-listening axis can be held. It must therefore be approached through what the ‘plus-one’ person can imply about it from what passes between  and . This can be thought of as (what the +1 perceives to be) the ‘governing metaphor’ of the speaking-and-listening process. The cycle of metaphors point towards what is ignored/left out from the originating narrative. A second phase involves working forensically with the trio to uncover the dilemma implicit in the originating story together with its underlying impossibility. This second phase is usefully supported by a fourth person whose role it is to support this process. For more on this, see formulating network interventions. The dotted blue line arrow from  to  indicates the unconscious primary process in  supporting the reading , taken up further in the blogs on the quadripod, and on the difference between the Kleinian object and the Lacanian symptom.